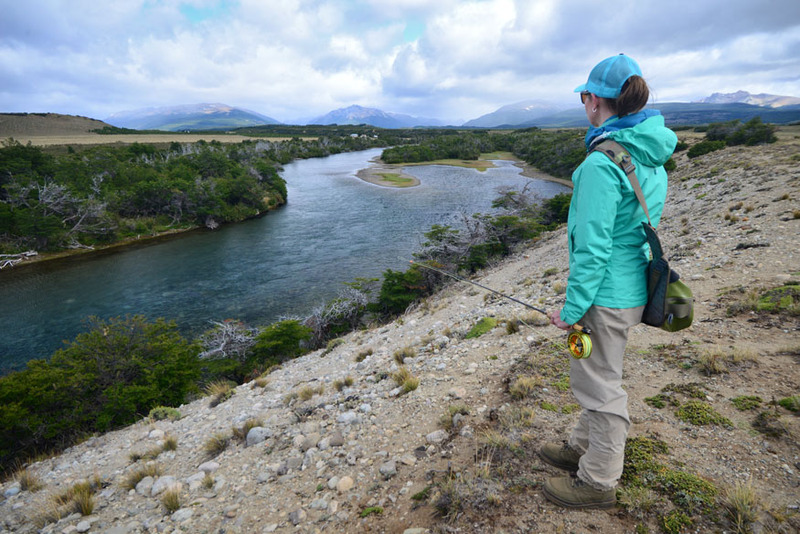 Headhunting for big trout in the heart of Patagonia. HE WIND IS NO JOKE. That’s the first thing they ought to tell you about Patagonia, I thought, as I winced in pain. I had just buried a Double Deceiver in my back, both hooks digging in from the feel of it, and I was suppressing the urge to turn the air blue. The day was not going well. I rotated awkwardly and asked my wife, Tracy, to pry the fly free. As she performed triage, I stared at the mountains rising hard out of the edge of the lakeshore. 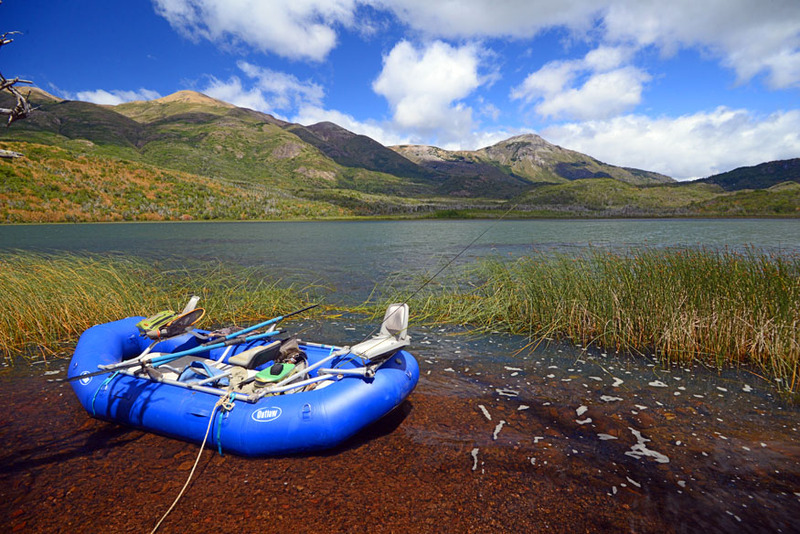 We were bobbing in a boat on Lago Larga, a small high-altitude lake on the eastern border of Patagonia’s vast Los Alerces National Park, on the northern end of the region. The Patagonia region of Argentina, I was surprised to learn, is approximately the length of the American West Coast. We were in Chubut Province (roughly analogous geographically to Northern California), trying desperately to put the third leg on what the locals call the Patagonian Grand Slam. The mountains of Los Alerces National Park, part of the Andes range, rise hard out of the picturesque plain surrounding the Welsh settlement town of Trevelin. The area is home to brook, rainbow, and brown trout, some of which, are very large. Our head guide for the week, Emiliano Luro—a knowledgeable former schoolteacher—had taken one look in my box of gargantuan stoneflies and immediately picked out the very largest. His hunch was proved right when a two-foot silver torpedo promptly launched itself off the bottom of the lake and smashed my fat fly as it flew into the air. I, of course, missed the set, but fortunately that rainbow had lots of willing friends. Both Tracy and I left the lake worn out and smiling. You could catch rainbows like that forever. 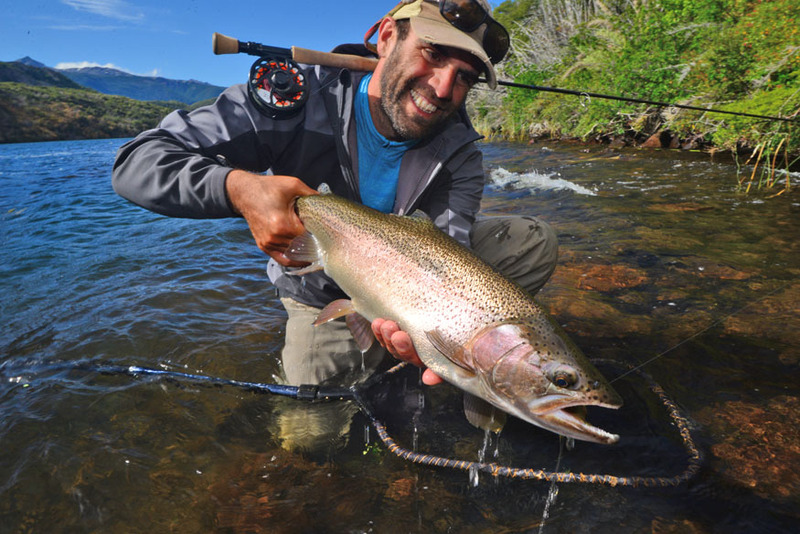 There was only one problem: I hadn’t really come to Patagonia to catch rainbow trout. You see, brown trout are, for me, something of an obsession. I grew up in Arkansas, which shares Patagonia’s distinction of producing world-record class browns. As a result, the brown trout has always held a certain extra cachet in my personal conception of a trophy fish. I reasoned that the brown trout— a European originally, just like most Argentines—evolved in conjunction with human angling. It has thus been a combatant in our private arms race the longest, and (at least in my experience) that makes it the hardest trout to catch, especially in trophy sizes. I knew Patagonia had huge browns, and so I had shown up with flies so large, the locals laughed as they passed them from hand to hand. My guides, however, seemed professionally interested in seeing me give them a try. The Welsh town of Trevelin borders Los Alerces National Park, one of the most spectacular places to catch big trout in the world. My first chance was on the Futaleufú River, a gorgeous tailwater just outside the Welsh colonial town of Trevelin, primarily used by the local guide culture as a bunny-slopes rainbow trout factory. There were big browns in its clear blue waters, but they rarely rose to dry flies, which most visiting anglers preferred by default. Not me; our guide for the day, Nico Fliess, smiled in anticipation as I unlimbered my 8-weight, with its massive sinking line, and tied on a fly the size of a chinchilla. Although already a father of four, Nico was young and energetic (possibly due to his fondness for maté, the local tealike energy drink). He seemed amused by my plan to break the rules, as it were. One of my first casts on the Futaleufú will haunt me forever; I chucked my articulated yellow contraption across a swirling whirlpool and onto a large shelf, and quickly stripped it back. Both Nico and I saw a shadow the size of a Labrador retriever surge off the bottom and smash my fly. I set the hook and felt the head shake only a truly enormous brown trout can impart—that slow pulse, with enough of a pause between the surges to let you know the trout’s head is tracking across inches as it shakes, like a greyhound slaughtering a hare. I raised the rod, began to recover line, and then it was gone. The hook hadn’t sunk in; my set at long range had not been sufficient; the fish beat me. Dejected, I looked back to Nico. “That might have been the biggest brown trout I have ever seen in the Futaleufú,” he admitted in a small voice. “In fact, it might have been a king salmon.” I asked him whether he thought that was a real possibility (yes, Patagonia also has salmon), but neither of us had ever seen a salmon attack a fly quite like that, and anyway, it was too early for their run. “Twenty-eight inches, you think?” I asked, intentionally seeking solace in a conservative estimate. “No,” Nico said sadly, shaking his head. “More like thirty. More than thirty.” I went back to plying the waters, only to watch the same movie end the same way several more times that day. We caught fish (Tracy delighted in dry fly fishing at short range for willing rainbows), but I lost what would have been my personal best brown trout two more times that day. The very best thing about experiencing Patagonia is not the Malbec they serve habitually with every meal, or the exquisite, crystal clear lake water that we drank, showered in, and plied for trout, or even the astonishingly good food: the prosciutto and capocollo (dry cured hams), the bread baked chlorine-free with pure lake water, or the olives. No, it is the biodiversity. Bees abound. There are actual flocks of game birds just walking beside the gravel roads, healthy working ranches full of livestock and enormous European hares, and a surfeit of plant life (including, it being summer in February there, stands of wildflowers like purple lupine). But above all, Patagonia has the richest biodiversity of salmonids of any place on earth. Salmonids aren’t native, but they all flourish; rainbow and brown trout, king salmon, Atlantic salmon, and even Labrador-grade brook trout. All this biodiversity isn’t found smashed together in one river, of course. Rather, there are so many different watersheds that in one day, you could theoretically catch a rainbow on a dry fly in a lake at breakfast, drive a few minutes to chase browns with streamers in a broad river at midday, then finish by swinging for brookies in a lake-fed stream in the evening. The most beautiful river of the region way well be the Corcovado. It is fed, much like the Yellowstone River, from a large lake: Lago General Vintter, which spans the Argentine–Chilean border. Reportedly, huge rainbows as well as truly massive brook trout spend most of their year in the lake, but make two runs into the Corcovado River to spawn. These runs (one for the rainbows and one for the brookies, with their counterparts coming in to feast on fresh trout eggs) bookend the season. 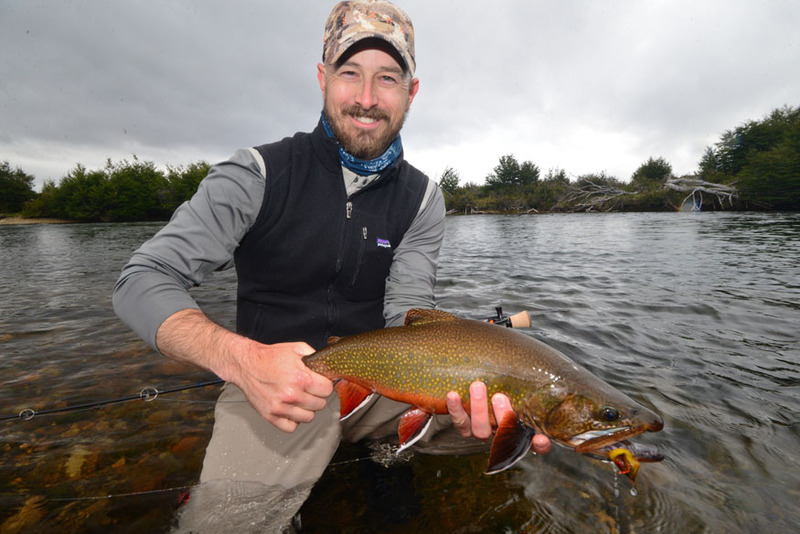 We were able to catch the very beginning of the brook trout run, which starts in Patagonia’s fall (late February). Fishing for huge brook trout in the Corcovado resembles nothing so much as Erie steelheading, if only the Erie river bottoms were dead clean and there were absolutely no other anglers for miles. The trout, as Emiliano Luro explained from his long experience, stay clustered together, holding in certain specific runs. While aggressive, they have a Jekyll-and-Hyde mentality when it comes to flies. Swing the same pattern in front of the same fish for two hours, and he might ignore it for all but 15 minutes, and then violently slash at it during that specific window of time. The reasons are known only to the brookies themselves. Big brook trout fight differently from big rainbows or even browns. They are bulldogs, surging then holding, more like a redfish, although they occasionally jump. Their colors range from greenish to oiled bronze to even brick red. Their spots are quasi-fluorescent, but they retain their slick juvenile skins even into large adulthood, making the spots almost invisible unless you turn them just so, when they erupt and glow in the light. In sum, they are some of the most beautiful trout I have ever caught, more akin to endangered Montana bull trout than to the blue-line brookies of the Appalachians. Our day on the Corcovado was a restful one, with a long hike over a friendly estancia, lunch near an unoccupied gaucho home, and a nice reminder that those who single-mindedly pursue one goal often wind up missing out on life along the way. 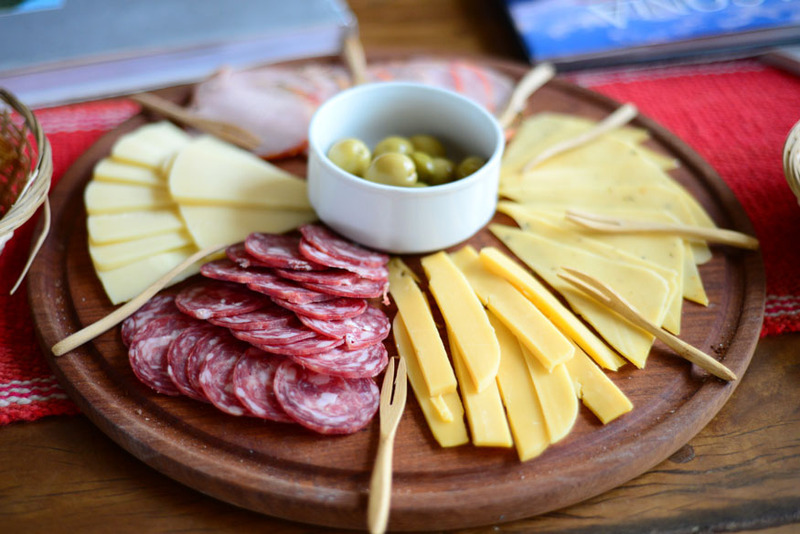 In addition to providing access to a number of waters that flow through private property, local guides can help you sample the locally favorite meats, cheeses, and the ever-present Malbec. Which is not to say, of course, that I had given up on catching a monster brown. The third guide of our trip was a voluble Argentine named Gonzalo Martinez—a trained sushi chef who briefly worked in the Musée d’Orsay in Paris. He was the guide who took us to Lago Larga, a deep pothole of a mountain lake, chockfull of huge browns that typically show themselves about three to five times a day. By that point in our trip, the wind had become so ever-present as to begin to fade into the background; a nuisance, like a sunburn, which makes its presence known only from time to time. One such violent gust was the one that buried my Double Deceiver between my shoulder blades. But in all honesty, that might have been the only day I could look back on and wish it were windier. If it had been, I might not have seen the truly epic scope of my failure. The problem, I eventually worked out, was the flies. They worked; oh yes, they worked almost too well. In a lake known for producing three or so fish a day, mostly making slashing attacks, we pulled (and counted) no less than twenty-one. Many of those fish were over the two-foot line. A couple rivaled the Labrador retriever I lost on the Futaleufú. About a third of those fish actually swatted my fly, but the same issue continued; I simply could not get a hook set on any but the smallest browns. While we wound up breaking the imaginary 20-inch threshold, I remained haunted by what could have been. My flies, you see, I had tied on hooks that I usually reserve for striped bass. The wire gauge was of the heaviest size, and I was not yet experienced enough with stone-mouthed mature browns to truly set the hook with a tarponlike vigor. We returned the next day, armed only with my smaller-hooked Double Deceiver, and I managed to boat the largest brown, which saw fit to strike. But the magic spell had broken; whether because the fish saw the flies the day before, or merely for the usual reasons of weather change and fickle trout brains, we drew a standard hand, and saw only three of Lago Larga’s huge denizens. Our stay was with the Lago Rosario Lodge south of Trevelin, which can be booked through Justin Witt’s excellent Hemispheres Unlimited service. This is not the kind of trip you want to take without an experienced hand around to help out. There comes a point in any trip—and indeed sometimes in life—when it’s time to stop chasing the arbitrary goals we set for ourselves and take a step back to appreciate what we already have. The last day of our trip rolled around, and Gonzalo asked if we wanted to once again pursue that monster brown. It was tempting; by that point I had landed a 23-inch rainbow, a 21-inch brookie, and a 22-inch brown trout, but I now knew for a certainty what else was out there. I could feel the pulse of those huge fish again; their surging heads as they shook the fly, then the absolute anticlimax of the line going slack. And then I looked at Tracy. A new angler, she had nonetheless gamely hung with me for an entire week; her large rainbow from the first day had been followed by day after day of fruitless headhunting. She was sunburned, worn out, and giving me the same haggard I’m with you wherever you go look she had worn for days. I owed her better, and I knew it, and so I told Gonzalo no. A friend told me not long before I left that you don’t really want what you deserve in life, and he was right; I had already caught more gorgeous mature fish than I deserved, and I had only myself to blame for those I had lost. This would be Tracy’s day. Drift boats are uncommon in Patagonia because they are difficult to import. Most guides favor rafts, which can be shipped in pieces. And so we went to the Rio Frío, a small stream with small, eager trout. Tracy, who came into the week having thrown only a 5-weight on a handful of occasions, gleefully raked in fish after fish. After some consultation with Gonzalo, her casting suddenly ascended to an entirely different level; her line sailed through the air, cutting the wind instead of being shouldered aside by it. Her rod flicked, and the dry fly at the end of her tippet settled perfectly onto the water, where a trout immediately inhaled it. All told, she caught more than 40 fish. The author hoisting a cooperative brook trout. You don’t go to the other side of the world to bag trophies like a mountain climber knocking off peaks. You don’t even go for the food or the gregarious and friendly people or the gorgeous unspoiled landscape. You go because you love to fish, and you want the people you love to know what that means; and when they understand, when they truly see it the same way you do, you realize that you couldn’t have found anything more valuable there, no matter what. This article originally ran in the January/February 2017 issue of American Angler magazine. 2 Responses to "Mountain Madness"
Zach, finally got around to reading. Great trip and what a disaster the wind can be. Truly wonderful article. I have fly fished for 50 years, and years ago tied my own flies. A question. Why are we (me at least) always in quest of the “big ” fish. Why not lots of 5″ mountain brookies???????? ?